Even beginners can purchase a robot and immediately participate in tournaments! 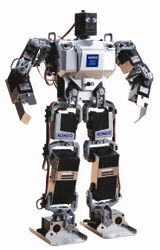 ROBO-ONE holds the ROBO-ONE Light tournament that allows commercially available robots certified by the ROBO-ONE Committee (certified robots) to participate as long as they are not modified. This makes it easy for even beginners to participate in the tournament. 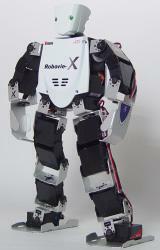 Self-built and modified robots must weigh 1 kg or less and meet other strict conditions. 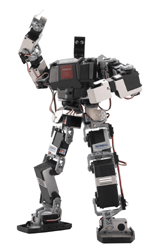 This allows commercially available robots to compete on a level or better playing field with self-built robots controlled by experienced operators. 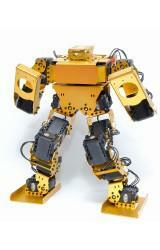 MANOI AT01 Robot Yuenchi / MANOI Planning Co., Ltd.
KHR-3HV Complete Set, ROBO-ONE Customer Specs. 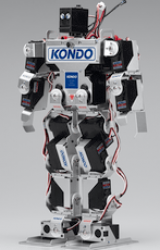 Robot Yuenchi / MANOI Planning Co., Ltd.
KHR-1 KONDO KAGAKU CO., LTD.
KHR-1HV KONDO KAGAKU CO., LTD.
KHR-2HV KONDO KAGAKU CO., LTD.
KHR-3HV / KHR-3HV Ver. 1 / Ver. 2 / Set with Li-Fe battery KONDO KAGAKU CO., LTD.
KXR-L2 KONDO KAGAKU CO., LTD. 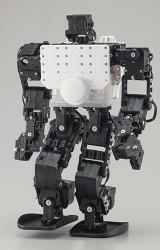 Robot Yuenchi / MANOI Planning Co., Ltd. Assembled in accordance with assembly manual. Modifications listed in the user’s manual are allowed, but if equipping with a LiPo battery, only PowerLand products or LEOPARD-POWER 11.1V 850mAh ,if equipping with a LiFe battery,only Robot Yuenchi sold by 9.9V 850mAh or KONDO products are llowed. 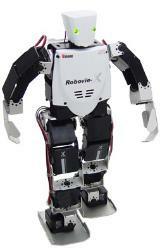 KHR-3HV Complete Set, ROBO-ONE Customer Specs. Assembled in accordance with included assembly manual. ●Assembled in accordance with included assembly manual. ●Control board can be replaced and cables and sensors added. There are no stipulations regarding boards used, but be aware of weight and size restrictions, etc. ●HV conversion using KRS-788HV is possible.Frames related to HV conversion, battery mounting and body cover can be used, but extension and shortening of each part of the main body can not be done. Battery stipulations have been eliminated. Genuine manufacturer parts are recommended, but if using the products of other companies, use them on your own responsibility. Take adequate precautions with respect to battery management and use. Control board can be replaced and cables and sensors added. There are no stipulations regarding boards used, but be aware of weight and size restrictions, etc. Assemble according to the attached assembly manual. The kit of Ver.1 may be assembled with the contents of the assembly manual of Ver.2. It is possible to replace control boards and add cables and sensors. There is no specification for the product to be used, but be careful about weight regulations, size regulations, etc. Up to 22 servos of authorized option can be added. Make additions within the scope of the manual attached with “Ext5ServoSetUpManual”, and do not change the external dimensions of the robot. A combination with the open leg frame is also possible. The front cowl (YHR-F1-2) of the chest is free for removal, but in order to prevent battery exposure, attachment of the base plate A (YHR-F1-1) and the battery holder A (YHR-G1-1) is mandatory. Removal of parts of the forearm is prohibited. Be in the state according to the assembly manual. There is no specification of the battery. Genuine manufacturer parts are recommended, but if using the products of other companies, use them on your own responsibility. Take adequate precautions with respect to battery management and use. Assemble according to the attached instructions. It is possible to add genuine optional sensor etc. By using genuine option frame or equivalent self-made frame (excluding sole of the foot), you can add up to 19 axes of official authorized servomotors. * For example, it is possible to make and install aluminum parts that fix VS-S092J with the same function as VS-X Servo Holder A, and install it. * It is not possible to use frames with different functions from the VS-X series. Also, self-making of sole parts is prohibited. For exterior self-made, extension of hand and shape change, it is possible within the scope of the ROBO-ONE convention to participate. Remodeling to shorten the legs, remodeling to lower the position of the connecting part between the arm and the body is not allowed. * It is possible to change the VS-X bracket A of the shoulder to VS-X bracket C and lower the position of the shoulder roll axis because it does not hit the connecting part between the arm and the torso. However, if there are provisions on radio equipment management, inspection items, and regulations in the competition, follow it. Although there is no battery designation, if there are regulations and inspection items related to batteries at the competition, follow it. Assemble according to the attached assembly instructions. Use of optional transceiver (RRC-T13/R13 or RRC-T11/R11). For the battery, use of included nickel-hydrogen battery or optional PR-S470P. 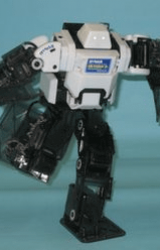 May be expanded using Dynamixel AX-18A, AX-12A and XL-320 to up to 22 degrees of freedom as long as the rules for ROBO-ONE Light certified robots are not violated. Competitors must make measurements and judgments themselves regarding weight and dimension increases. 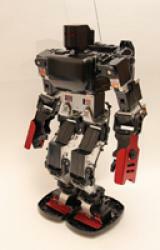 If regulations are exceeded, the robot will be ruled ineligible. No changes allowed to sole size or leg length. 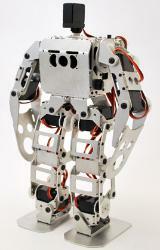 Outer coverings, hand parts (end-effectors, etc.) may be self-built. Replace or add the above within the scope of certification regulations. With the technologies and techniques of participants in ROBO-ONE tournaments getting better on a near daily basis, the barrier for beginners has gotten high. 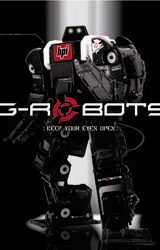 The ROBO-ONE Light tournament has introduced the certified robot program and is held to provide the opportunity for beginners to battle it out with seasoned operators on a level playing field. 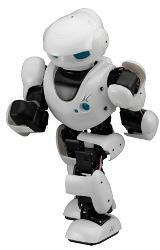 It is intended to encourage beginners to build their own robots and further vitalize the market. ROBO-ONE Light is a tournament that makes it easy for even beginners to participate because it gives commercially available robots registered under the certified robot program a handicap against modified and self-built robots. 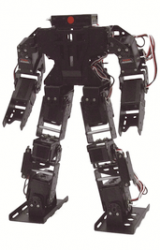 Commercially available robots registered under the certified robot program do not need to conform with regulations on weight, sole size, arm length, center of gravity position, etc., as long as they are not modified. Self-built robots, however, must weigh no more than 1 kg and meet the rest of the “Robot Regulations” for sole size, arm length, center of gravity position, etc. stated in official competition rules for ROBO-ONE tournaments. Manufacturers who would like to register the robots they sell commercially as certified robots must first join the Biped Robot Association. Details are available on the Association’s website.